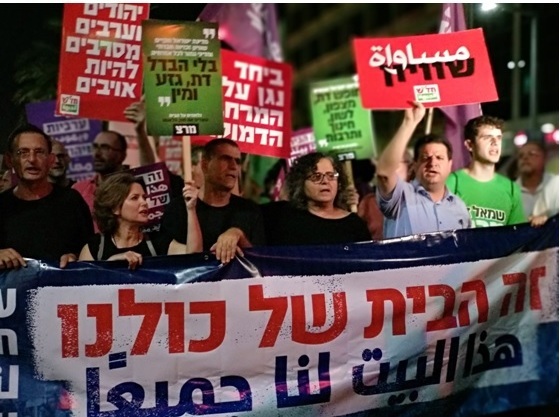 Seven thousand protesters marched through central Tel Aviv on Saturday night, July 14, to protest the controversial, government-sponsored “nation-state bill,” calling it racist and discriminatory. Under the banner “This is home for all of us,” public figures, MKs from Hadash and Meretz, and peace and social activists addressed the demonstration, in which participants marched from Rabin Square to Dizengoff Center. The bill is expected to be brought before the Knesset tonight (Monday) for a final vote. Twenty organizations participated in the march: Hadash – Communist Party of Israel, Omdim Beyachad (Standing Together); The Association of Ethiopian Jews; The New Israel Fund; Peace Now; The Israel Religious Action Center; Sikkuy; The Coalition Against Racism in Israel; Mossawa Center; Young Labor; Meretz; The Arab Movement for Peace; The Association for Civil Rights in Israel; Zazim – Community Action; The Negev Coexistence Forum for Civil Equality; AJEEC NISPED; Kulan – Feminist Organization; Socialist Struggle; Combatants for Peace; and Shatil. “The nation-state bill won’t make us disappear, but it will do huge damage to democracy [in Israel]” he said. Tonight’s “mass protest is an important step in our fight against fascism.… Racist legislation of a government that fears power; of a majority that tramples the minority, will not remove us. We will remain in our homeland; we will remain here – two nations. The thousands who came here tonight give us hope that we can, in the future, achieve a state in which there will be equality and peace,” Odeh opined. Rabbi Gilad Kariv, CEO of the Movement for Progressive Judaism, slammed the bill as “despicable.” He told elected officials not to be silent: “Do not play your political poker game for the elections at the expense of the image and values of Israeli society and at the expense of its people,” he said. Kariv ended his speech with a prayer for peace in the South – a topic not forgotten by speakers at the protest, which came at the end of a day of intensified violence on both sides of the Gaza border. The message of Saturday’s protest, according to the organizers, was that “we are all equal citizens – Arabs and Jews, women and men, Mizrahim, Ethiopians, those of us from Russia, and members of the LGBTQ community.